Married Name circa November 1909 As of circa November 1909,her married name was Branigan. Anna (?) was born circa 1891 at Wisconsin. She married Thomas Branigan, son of (?) Branigan, circa November 1909. Will E. Hewes was born in May 1857 at Wisconsin. He was the son of Ralph Hewes and Cordelia Sage. Will E. Hewes married Elsie L. Morrison, daughter of Thomas Morrison and Ellen P. Sweet, circa 1881. Will E. Hewes died after 1930. [S247] U.S. Federal Census 1870 U.S. Federal Census, by Ancestry.com, Year: 1870; Census Place: Delavan, Walworth, Wisconsin; Roll: M593_1741; Page: 53A; Image: 109; Family History Library Film: 553240. [S243] U.S. Federal Census 1920 U.S. Federal Census, by Ancestry.com, Year: 1920;Census Place: Delavan, Walworth, Wisconsin; Roll: T625_2019; Page: 9B; Enumeration District: 138; Image: 725. [S250] U.S. Federal Census 1930 U.S. Federal Census, by Ancestry.com, Year: 1930; Census Place: Delavan, Walworth, Wisconsin; Roll: 2615; Page: 9B; Enumeration District: 3; Image: 627.0. Married Name circa 1881 As of circa 1881,her married name was Hewes. Elsie L. Morrison was born in March 1859 at Wisconsin. She was the daughter of Thomas Morrison and Ellen P. Sweet. Elsie L. Morrison married Will E. Hewes, son of Ralph Hewes and Cordelia Sage, circa 1881. Elsie L. Morrison died after 1930. Elsie L. Morrison had 5 with 4 living in 1900 children. [S248] U.S. Federal Census 1860 U.S. Federal Census, by Ancestry.com, Year: 1860; Census Place: Delavan, Walworth, Wisconsin; Roll: M653_1434; Page: 180; Image: 188; Family History Library Film: 805434. [S247] U.S. Federal Census 1870 U.S. Federal Census, by Ancestry.com, Year: 1870; Census Place: Delavan, Walworth, Wisconsin; Roll: M593_1741; Page: 50A; Image: 103; Family History Library Film: 553240. [S246] U.S. Federal Census 1880 U.S. Federal Census, by Ancestry.com, Year: 1880; Census Place: Delavan, Walworth, Wisconsin; Roll: 1449; Family History Film: 1255449; Page: 40A; Enumeration District: 223; . Kathleen Hewes was born in December 1882 at Wisconsin. She was the daughter of Will E. Hewes and Elsie L. Morrison. Married Name before 1913 As of before 1913,her married name was Lowe. Ethel Hewes was born in May 1884 at Wisconsin. Ethel Hewes married Roy Lowe before 1913. Sam Dille Hewes was born in March 1889 at Wisconsin. Sam Dille Hewes married Anna Mae Lloyd before 1913. On 5 June 1917 at World War I Draft Registration, Rock, Wisconsin, reported wife and 3 children. [S243] U.S. Federal Census 1920 U.S. Federal Census, by Ancestry.com, Year: 1920;Census Place: Beloit Ward 2, Rock, Wisconsin; Roll: T625_2013; Page: 7A; Enumeration District: 87; Image: 738. Thomas Morrison was born circa 1831 at New York. He married Ellen P. Sweet, daughter of Rufus Sweet and (?) Austin, before 1854. Thomas Morrison died before 1880. Married Name before 1854 As of before 1854,her married name was Morrison. Ellen P. Sweet was born in August 1836 at Ohio. She was the daughter of Rufus Sweet and (?) Austin. Ellen P. Sweet married Thomas Morrison before 1854. Ellen P. Sweet died after 1920. Ellen P. Sweet had 2 with 1 living in 1900 children. [S249] U.S. Federal Census 1850 U.S. Federal Census, by Ancestry.com, Year: 1850; Census Place: Delevan, Walworth, Wisconsin; Roll: M432_1007; Page: 306A; Image: 287. Name Variation Grace Bowman was also known as Frank Grace. Married Name circa 1907 As of circa 1907,her married name was Klein. Grace Bowman was born in June 1879 at Minnesota also reported as Jun 1871. She was the daughter of Charles Edmond Bowman and Harriett Louisa Sherwood. Grace Bowman married Carl W. Klein circa 1907. Grace Bowman had 1 with 1 living in 1910 children. [S246] U.S. Federal Census 1880 U.S. Federal Census, by Ancestry.com, Year: 1880; Census Place: Herrick, Deuel, Dakota Territory; Roll 112; Family History Film: 1254112; Page: 486D; Enumeration District: 45; Image: 0280. [S245] U.S. Federal Census 1900 U.S. Federal Census, by Ancestry.com, Year: 1900; Census Place: Springfield, Jackson, Wisconsin; Roll T623_ 1792; Page: 1A; Enumeration District: 56. [S244] U.S. Federal Census 1910 U.S. Federal Census, by Ancestry.com, Year: 1910; Census Place: Springfield, Jackson, Wisconsin; Roll T624_1713; Page: 6B; Enumeration District: 88; Image: 1224. Fred Jay Bowman was born on 11 April 1881 at South Dakota. He was the son of Charles Edmond Bowman and Harriett Louisa Sherwood. Fred Jay Bowman married Hulda (?) before September 1918. Fred Jay Bowman died in 1941. Fred Jay Bowman was a auctioneer in 1918. On 12 September 1918 at Jackson, Wisconsin. In October 1939 Mr and Mrs Albert Kaney, North Freedom, spent Tuesday with their cousins, Fred and Doyle Bowman. [S243] U.S. Federal Census 1920 U.S. Federal Census, by Ancestry.com, Year: 1920;Census Place: Black River Falls Ward 1, Jackson, Wisconsin; Roll T625_1990; Page: 2B; Enumeration District: 44; Image: 101. Belle Bowman was born in July 1883 at Wisconsin. Married Name circa 1919 As of circa 1919,her married name was Tennant. Goldie M. Bowman was born on 6 March 1896 at Wisconsin. Goldie M. Bowman married Leo A. Tennant circa 1919. Goldie M. Bowman died on 29 April 1976 at Centralia, Washington, at age 80. Goldie M. Bowman obtained US Social Security Card at Washington; last residence Centralia, Lewis, Washington. [S250] U.S. Federal Census 1930 U.S. Federal Census, by Ancestry.com, Year: 1930; Census Place: Springfield, Jackson, Wisconsin; Roll 2575; Page: 8B; Enumeration District: 27; Image: 1131.0. Doyle Sherwood Bowman was born on 10 October 1900 at Wisconsin. Doyle Sherwood Bowman married Emma J. Tuft circa 1921. Doyle Sherwood Bowman died on 11 March 1968 at Monterey, California, at age 67. In October 1939 Mr and Mrs Albert Kaney, North Freedom, spent Tuesday with their cousins, Fred and Doyle Bowman. [S243] U.S. Federal Census 1920 U.S. Federal Census, by Ancestry.com, Year: 1920;Census Place: Springfield, Jackson, Wisconsin; Roll T625_1990; Page: 13A; Enumeration District: 61; Image: 396. [S250] U.S. Federal Census 1930 U.S. Federal Census, by Ancestry.com, Year: 1930; Census Place: Black River Falls, Jackson, Wisconsin; Roll 2575; Page: 17B; Enumeration District: 7; Image: 875.0. Leo A. Tennant was born on 19 February 1891 at Wisconsin. He married Goldie M. Bowman, daughter of Charles Edmond Bowman and Harriett Louisa Sherwood, circa 1919. Leo A. Tennant died on 29 December 1975 at Centralia, Washington, at age 84. Married Name circa 1921 As of circa 1921,her married name was Bowman. Emma J. Tuft was born circa 1900 at Wisconsin. She married Doyle Sherwood Bowman, son of Charles Edmond Bowman and Harriett Louisa Sherwood, circa 1921. Married Name before 1919 As of before 1919,her married name was Bowman. Hulda (?) was born in 1883 at Wisconsin. She married Fred Jay Bowman, son of Charles Edmond Bowman and Harriett Louisa Sherwood, before September 1918. Hulda (?) died in 1962. Pearl M. Bowman was born circa June 1919 at Wisconsin. She was the daughter of Fred Jay Bowman and Hulda (?). Carl W. Klein was born circa 1882 at Wisconsin. He married Grace Bowman, daughter of Charles Edmond Bowman and Harriett Louisa Sherwood, circa 1907. 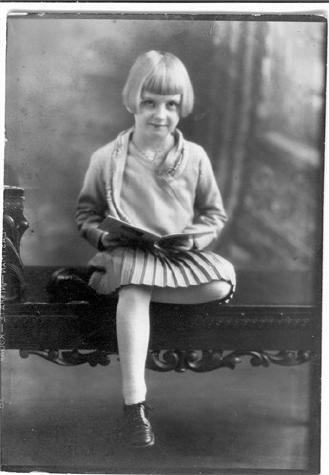 Dorothy Klein was born circa 1907 at Wisconsin. She was the daughter of Carl W. Klein and Grace Bowman. Mark Hanna Grant was born on 5 June 1897 at Washington. He was the son of Oscar E. Grant and Mary Ellen Pettijohn. Mark Hanna Grant married Violet Grace Bailey, daughter of Charles Addison Bailey and Lora A. Foster, on 16 June 1928 at Walla Walla, Washington. Mark Hanna Grant died on 29 July 1928 at died of pneumonia, Washington, at age 31. [S243] U.S. Federal Census 1920 U.S. Federal Census, by Ancestry.com, Year: 1920;Census Place: Lincoln, Walla Walla, Washington; Roll: T625_1943; Page: 9A; Enumeration District: 116; Image: 206. Name Variation Irvin Thomas Sparling was also known as Irwin. Name Variation Irvin Thomas Sparling was also known as Irvin I. He was the son of William Elmer Sparling and Ella Nevada Thomas. Irvin Thomas Sparling married Violet Grace Bailey, daughter of Charles Addison Bailey and Lora A. Foster, on 19 September 1920 at Waukegan, Illinois, Irving T. Sparling of LaCrosse, who has been telegraph operator here for three months, was married Sunday, Sept. 19, 1920 to Miss Violette Bailey of Baraboo. They ceremony occurred in the Methodist parsonage at Waukegan, Ill. And was officiated by the Methodist minister. The bride was tastefully dressed in a brown traveling suit and picture hat. They young couple left on the noon train for a wedding trip to Chicago, Milwaukee, St Paul and Minneapolis, arriving in Reedsburg on Wednesday, Sept. 22nd and will live at 316 West Main St. (from Reedsburg Free Press 9/30/1920). Irvin Thomas Sparling and Violet Grace Bailey were divorced before 1924. Irvin Thomas Sparling married Grace C. Baake, daughter of Charles A. Baake and Jennie Van Oost, circa 1924. Irvin Thomas Sparling died on 14 February 1972 at King, Wisconsin, at age 73. 1 June 1905 Trempealeau, Trempealeau, Wisconsin Irvin Thomas Sparling appeared on the census of 1 June 1905 in the household of William Elmer Sparling at Trempealeau, Trempealeau, Wisconsin. Irvin Thomas Sparling obtained US Social Security Card at Illinois; last residence King, Waupaca, Wisconsin. [S6] Wisconsin, Wisconsin Vital Record to 1907, Reel: 0286 Record: 000101. [S245] U.S. Federal Census 1900 U.S. Federal Census, by Ancestry.com, Year: 1900; Census Place: Trempealeau, Trempealeau, Wisconsin; Roll: T623_1819; Page: 4A; Enumeration District: 137. [S244] U.S. Federal Census 1910 U.S. Federal Census, by Ancestry.com, Year: 1910; Census Place: Trempealeau, Trempealeau, Wisconsin; Roll T624_1739; Page: 3B; Enumeration District: 173; Image: 1072. [S250] U.S. Federal Census 1930 U.S. Federal Census, by Ancestry.com, Year: 1930; Census Place: Chicago, Cook, Illinois; Roll 481; Page: 15B; Enumeration District: 1517; Image: 1004.0. Name Variation Audrey Mayon Sparling was also known as Audrey Mayone. Name Variation Audrey Mayon Sparling was also known as Audred. Married Name before 1948 As of before 1948,her married name was Szewczykowski. Married Name before 1948 As of before 1948,her married name was Sieczkowski. Married Name before 1948 As of before 1948,her married name was Siezykowski. Audrey Mayon Sparling was born on 10 February 1923 at Baraboo, Sauk, Wisconsin. She was the daughter of Irvin Thomas Sparling and Violet Grace Bailey. Audrey Mayon Sparling married (?) Sieczkowski before 1948. Audrey Mayon Sparling and (?) Sieczkowski were divorced before 1960. Audrey Mayon Sparling died on 15 June 1998 at Milwaukee, Wisconsin, at age 75 also reported as 16 June 1998; Audrey M. Sieczkowski, died peacefully at the home of her daughter, Lisa on Monday morning, June 15, 1998. 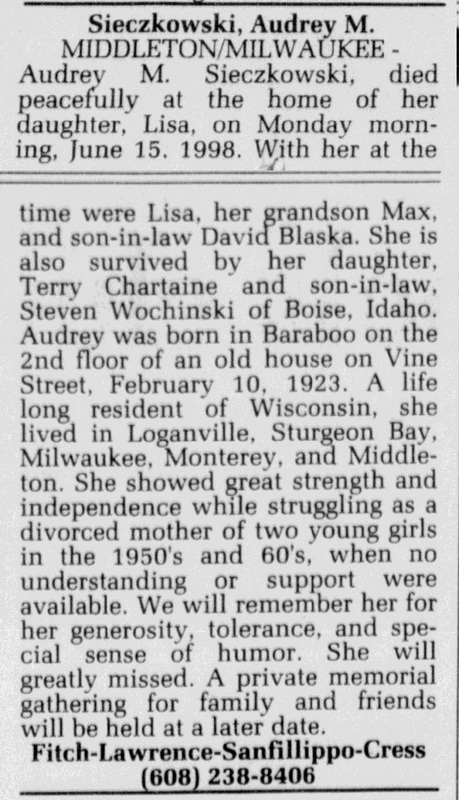 With her at the time were Lisa, her grandson Max, and son-in-law, David Blaska. 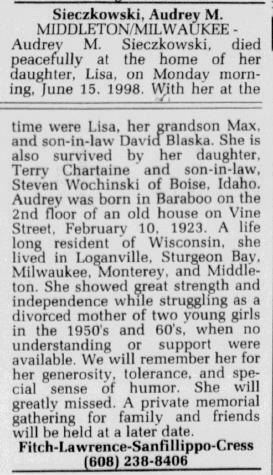 She is also survived by her daughter, Terry Chartaine and son-in-law, Steven Wochinski of Boise, Idaho. Audrey was born in Baraboo on the 2nd floor of an old house on Vine Street, February 10, 1923. A life long resident of Wisconsin, she lived in Loganville, Sturgeon Bay, Milwaukee, Monterey, and Middleton. She showed great strength and independence while struggling as a divorced mother of two young girls in the 1950's and 1960's, when no understanding or support were available. We will remember her for her generosity, tolerance, and special sense of humor. She will be greatly missed. A private memorial gathering for family and friends will be held at a later date. Audrey Mayon Sparling obtained US Social Security Card at Wisconsin; last residence Middleton, Dane, Wisconsin. On 8 July 1930 Mrs. Allen Nieman and son and Audrey Sparling are spending two weeks with the former's mother at Beloit. [S250] U.S. Federal Census 1930 U.S. Federal Census, by Ancestry.com, ED56-22. Dwelling 59. [S373] U.S. Federal Census 1940 U.S. Federal Census, by Ancestry.com, Year: 1940; Census Place: Sturgeon Bay, Door, Wisconsin; Roll: T627_4474; Page: 8A; Enumeration District: 15-17. Name Variation Edward H. Schattschneider was also known as Eddy. Edward H. Schattschneider was born on 7 October 1894 at Milwaukee, Milwaukee, Wisconsin. He was the son of Herman Schattschneider and Johanna Bohm. Edward H. Schattschneider married Alma Kloehn, daughter of Fritz Kloehn and Fredericka (? ), circa 1915. Edward H. Schattschneider married Violet Grace Bailey, daughter of Charles Addison Bailey and Lora A. Foster, after July 1939. Edward H. Schattschneider died on 22 June 1967 at Milwaukee, Wisconsin, at age 72. He was buried after 22 June 1967 at Highland Memorial Cemetery, New Berlin, Waukesha, Wisconsin, This cemetery is in Waukesha County about 20 blocks or so from the Milwaukee County line. 1 June 1905 Milwaukee, Milwaukee, Wisconsin Edward H. Schattschneider appeared on the census of 1 June 1905 in the household of Herman Schattschneider at Milwaukee, Milwaukee, Wisconsin. [S245] U.S. Federal Census 1900 U.S. Federal Census, by Ancestry.com, Year: 1900; Census Place: Milwaukee Ward 11, Milwaukee, Wisconsin; Roll: T623_1803; Page: 20A; Enumeration District: 94. [S244] U.S. Federal Census 1910 U.S. Federal Census, by Ancestry.com, Year: 1910; Census Place: Milwaukee Ward 11, Milwaukee, Wisconsin; Roll: T624_1725; Page: 14A; Enumeration District: 0098; Image: 657; FHL Number: 1375738. [S243] U.S. Federal Census 1920 U.S. Federal Census, by Ancestry.com, Year: 1920;Census Place: Milwaukee Ward 11, Milwaukee, Wisconsin; Roll T625_2001; Page: 3A; Enumeration District: 140; Image: 229. [S250] U.S. Federal Census 1930 U.S. Federal Census, by Ancestry.com, Year: 1930; Census Place: Milwaukee, Milwaukee, Wisconsin; Roll 2589; Page: 8B; Enumeration District: 132; Image: 239.0. Name Variation (?) Sieczkowski was also known as (?) Siezykowski. (?) Sieczkowski married Audrey Mayon Sparling, daughter of Irvin Thomas Sparling and Violet Grace Bailey, before 1948. (?) Sieczkowski and Audrey Mayon Sparling were divorced before 1960. Married Name circa 1924 As of circa 1924,her married name was Sparling. Grace C. Baake was born on 1 July 1904 at Michigan. She was the daughter of Charles A. Baake and Jennie Van Oost. Grace C. Baake married Irvin Thomas Sparling, son of William Elmer Sparling and Ella Nevada Thomas, circa 1924. Grace C. Baake died in March 1963 at age 58. [S244] U.S. Federal Census 1910 U.S. Federal Census, by Ancestry.com, Year: 1910; Census Place: Manistique Ward 4, Schoolcraft, Michigan; Roll: T624_675; Page: 8B; Enumeration District: 0242; Image: 305; FHL Number: 1374688. Name Variation William Charles Sparling was also known as Billy. William Charles Sparling was born on 10 February 1925 at Cook, Illinois. He was the son of Irvin Thomas Sparling and Grace C. Baake. William Charles Sparling died on 10 November 1966 at age 41. Name Variation William Elmer Sparling was also known as Will E.
William Elmer Sparling was born on 13 May 1863 at Wisconsin. William Elmer Sparling died on 17 July 1938 at age 75. 1 June 1905 Trempealeau, Trempealeau, Wisconsin He appeared on the census of 1 June 1905 at Trempealeau, Trempealeau, Wisconsin. William Elmer Sparling was a RR Station Agent. [S6] Wisconsin, Wisconsin Vital Record to 1907, Volume: 2 Page: 96. [S243] U.S. Federal Census 1920 U.S. Federal Census, by Ancestry.com, Year: 1920;Census Place: La Crosse Ward 17, La Crosse, Wisconsin; Roll: T625_1992; Page: 5A; Enumeration District: 107; Image: 719. [S250] U.S. Federal Census 1930 U.S. Federal Census, by Ancestry.com, Year: 1930; Census Place: La Crosse, La Crosse, Wisconsin; Roll: 2579; Page: 17A; Enumeration District: 29; Image: 350.0. Married Name 18 December 1890 As of 18 December 1890,her married name was Sparling. Ella Nevada Thomas died on 14 June 1956 at age 83. 1 June 1905 Trempealeau, Trempealeau, Wisconsin Ella Nevada Thomas appeared on the census of 1 June 1905 in the household of William Elmer Sparling at Trempealeau, Trempealeau, Wisconsin. Ella Nevada Thomas had 2 with 1 living in 1900 children. She had 2 with 1 living in 1910 children. [S6] Wisconsin, Wisconsin Vital Record to 1907, Reel: 0286 Record: 000102. Herman Schattschneider was born in May 1863 at Germany. He married Johanna Bohm circa 1888. Herman Schattschneider died before 1930. 1 June 1905 Milwaukee, Milwaukee, Wisconsin He appeared on the census of 1 June 1905 at Milwaukee, Milwaukee, Wisconsin. Herman Schattschneider immigrated in 1882 also reported as 1880. [S243] U.S. Federal Census 1920 U.S. Federal Census, by Ancestry.com, Year: 1920;Census Place: Milwaukee Ward 11, Milwaukee, Wisconsin; Roll: T625_2001; Page: 10A; Enumeration District: 136; Image: 115. Married Name circa 1888 As of circa 1888,her married name was Schattschneider. Johanna Bohm was born in November 1863 at Germany. She married Herman Schattschneider circa 1888. Johanna Bohm died after April 1930. 1 June 1905 Milwaukee, Milwaukee, Wisconsin Johanna Bohm appeared on the census of 1 June 1905 in the household of Herman Schattschneider at Milwaukee, Milwaukee, Wisconsin. Johanna Bohm immigrated in 1870 also reported as 1875. She had 6 with 5 living in 1900 children. She had 6 with 4 living in 1900 children. [S250] U.S. Federal Census 1930 U.S. Federal Census, by Ancestry.com, Year: 1930; Census Place: Milwaukee, Milwaukee, Wisconsin; Roll: 2598; Page: 26B; Enumeration District: 319; Image: 609.0.